Paul, Marilyn. 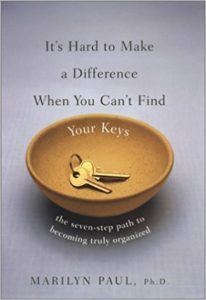 It’s Hard to Make a Difference When You Can’t Find Your Keys: The Seven Step Path to Becoming Truly Organized.New York, NY: Viking Press, 2003. Get organized with help from executive consultant Marilyn Paul.